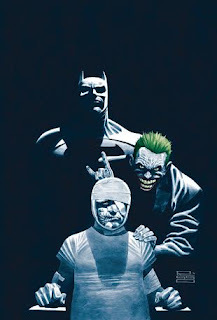 DC Entertainment’s creator-driven imprint, Vertigo, announced Dark Night: A True Batman Story, from legendary writer Paul Dini (Batman: The Animated Series, Batman Beyond, Lost) set to release in June 2016. The story is a harrowing and eloquent autobiographical tale of Dini’s courageous struggle to overcome a truly desperate situation, with brilliant illustrations by Eduardo Risso (100 Bullets). An extremely personal story for Dini – and the first time he's told it to the world – the book focuses on a night that he was assaulted and brutally beaten by strangers and left on the sidewalk. In this surprising original graphic novel, Batman is seen in a new light – not as the grim avenger of the night, but as a savior who helps a discouraged man recover from a brutal attack that left him unable to face the world. But despite how bleak his circumstances were, or perhaps because of it, Dini always imagined the Batman at his side, urging him along during his darkest moments. Dark Night: A True Batman Story will be available in comic book shops on June 15, 2016 and available everywhere books are sold on June 21, 2016.